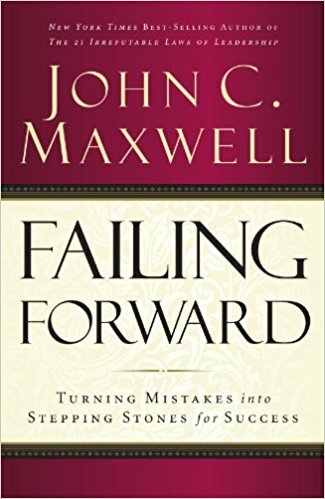 Failing Forward was written and published in the year 2000 by the popular leadership expert, speaker, pastor, coach, best selling American author and one of my favorite author, John C. Maxwell. He took a closer look at failure and reveals that, the secret of moving beyond failure is to use it as a lesson and as a stepping stone. Life is somewhat filled with trials and errors which he said, it's a necessary part of growth, and in order to walk the path of success, you may have to make some wrong turns along the way. "There are many ways to be a winner but there is only one way to be a loser and that is to fail and not look beyond the failure." -Kylie Rote Jr. He stated the main difference between people who achieve and people who are average? What makes achievers excel? Why do some people sky rocket while some plummet? What makes the difference? The answer to this question is simple; the difference is their perception of and response to failure said John C. Maxwell which is actually so true. Failure isn't a percentage or a test, it's not a single event, it's a process and there are no achievements without it. So what is failure not? Or how should you define failure? I remember when I started to learn digital photography and video production, we were out taking shots which included covering a full wedding event and that happened to be my second practical experience but with a much bigger audience and I was so afraid; afraid of what people may think of me being the only lady holding a camera, afraid of moving closer to my object, afraid of what people may say, afraid of not doing the job perfectly well, afraid of failing at it, afraid of this, afraid of that. And because of that fear, it limited my professionalism at the job and I could vividly remember my instructor yelling at me and asking me what's wrong? Why are you acting like this? To cut the long story short, when I got back home that day, I felt so bad that I felt I was a failure because I didn't put in my best performance but I also remembered thinking about everything later that night, looking at where I erred, my mistakes, then learning from it and moving on. And the next event I had to cover, I walked in with greater confidence and performed excellently better than the last Job I did. So what if I had given up? Or judge myself as a failure from that one experience? Or considered it as a stigma to be lived with? I probably won't have had the courage to cover another event. 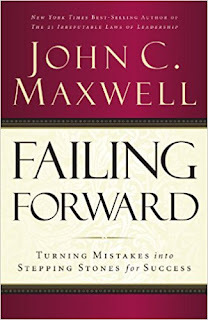 John C. Maxwell defined failure by saying, it's all in the way you look at it. Every person's life is filled with errors and negative experiences but know this: Errors become mistake when we perceive them and respond to them incorrectly. Mistakes become failures when we continually respond to them incorrectly. 1. Reject Rejection: Achievers do not label themselves as failures rather they keep the right perspective, they take responsibility for their action and do not take failure personal. 2. See Failure as Temporary: People who personalize failure see a problem as a hole they are permanently stuck in. But achievers see any predicament as temporary. 3. See Failures as Isolated Incidents: When achievers fail, they see it as a momentary event, not a lifelong epidemic. It's not personal. If you want to succeed, don't let any single incidence color your view of yourself. 4. Keep Expectations Realistic: If you want to take a stroll in your neighborhood, you can reasonably expect to have a few, if any, problems. But that's not the case if you intend to climb Mount Everest. It takes time, effort, and the ability to overcome setbacks. Keep hope alive but approach each day with reasonable expectations and do not get yourself hurt when things don't turn out perfectly. 5. Focus on Strength: What distinguishes winners from losers is that winners concentrate at all times on what they can do, not on what they can't do. Develop and maximize your strengths. 6. Vary Approaches to Achievement: Achievers are willing to vary their approaches to problems, they keep trying and changing until they have found something that worked for them. That's important in every walk of life, not just business. I highly recommend this book to anyone striving to succeed despite all odds, it can also be applied to your entire life and not just one part of it. I do hope you enjoyed this month's book review as much as I did while studying the book? Kindly share your thoughts with me and other readers as I look forward to the next book review with you all. P.S - You can also check out my previous book reviews using the label Book Reviews to search on the blog. Brilliant post! Been hearing so much about this book, where can i get it? I think you can get it from any available bookshop around you. God bless you for this! I'm so inspired! Thanks. GOD bless you more and more.